All of our devices are fully unlocked and sim free for all UK and International customers. You can even switch up your sim or service provider at any time as the handsets will remain unlocked. International and worldwide delivery is generally within 1-2 working days via FedEx, with full 12 month warranty. Also: Non-Eu costumers, don't forget you'll pay the Ex-VAT price! Its curved glass body juxtaposes the concepts of strength and light for a truly illuminating smartphone design. Its curvature is precision-crafted so the device melts into your grip and can be used comfortably with one hand. The Hybrid Dual Nano Sim makes this device perfect for work and play. The new HUAWEI FullView 5.8* inch RGBW Display is precision designed down to the last pixel. Offering a radiantly bright display while consuming less power. The edgeless fingerprint sensor with smart navigation instead of the virtual bar can offer an additional informative area. The new generation Leica Dual Camera combines a 12 MP RGB sensor with a 20 MP Monochrome camera to deliver clear, richly detailed expert quality photographs. The wide aperture lenses strike a large image sensor with a pixel size of 1.55 micrometers. Other features include AI image stabilisation, Capturing Living Moments and 960 fps Super Slow Motion. The 24 MP front camera offers AI-driven 3D facial modeling technology to follow the contours of your features, adjusting for the most flattering selfies. 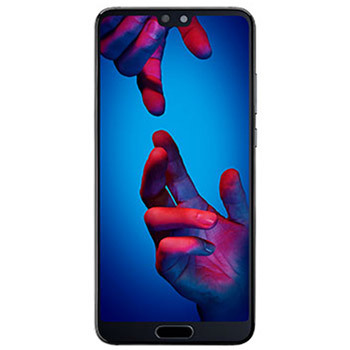 Powering the AI-driven photography system of the HUAWEI P20 is the Kirin 970 chipset, driving a host of new premium extras and creative tools for a superior smartphone experience. The mighty 3400 mAh HUAWEI SuperCharge battery can fast-charge at speed for maximum convenience. Enjoy Android™ 8.1 out of the box, powered by 4GB RAM, 128GB Memory and Dual Sim Capabilities.